Wow! Just stunning! This Delsey Bastille Lite Suitcase is really a beauty. It’s attractive minimalist design instantly caught my eye. It’s not just pretty on the outside either, but also gorgeous within and showcases some great features. Inside this beauty is a split book opening style providing two full packing compartments and a zippered divider. It’s designed to keep everything neat and organized without adding too much extra weight. Ultra lightweight and durable, it’s crafted of patent-pending Delsey exclusive thermoplastic composite. That apparently makes this bag shock resistant, extremely durable and one of the lightest cases on the market. So beautiful and strong like our favorite leading action heroins. Is it too good to be true? Read our review on the Delsey Bastille Lite Suitcase to find out. As far as the design itself, the ripped metal look and trendy colors make the Delsey Bastille Lite suitcase look beautiful. I really love the glossy finish because it can be easily wiped clean. The hardcase is thermoplastic composite, which means it’s not only attractive but more importantly very durable while still being lightweight. But their Achilles heel is usually a tendency to get scuffed. I talk about this in more detail further down in the article under User Reviews. As for the wheels, they roll smooth and silent even on more bumpy surfaces. The wheels also keep the bag balanced so it’s never top heavy, and takes all the weight off your body. I’m guilty of the whole rearrange my items, sit on the luggage, pull the zipper, and repeat until you get the bag closed, routine. But this Delsey luggage expands to give you 2 extra inches. And by the way, the zippers are different colors so that you know which zipper is for what. As the pictures show, there is a TSA approved zipper lock. The fact that it comes with a built in lock is so much better than having to mess with a purchased after-market lock. 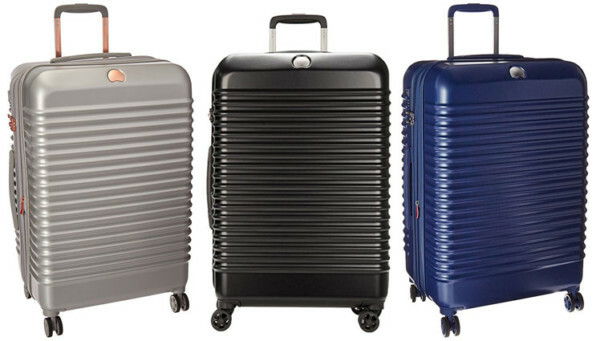 The Delsey Bastille Lite suitcase comes in 3 colors: Pearl grey, Black, and Blue. All the color options are really practical and professional. I’m head over heels for the pearl grey. It has rose gold hardware that make for a lovely contrast. It gives it a very rich feel. The black case has silver hardware. And the blue, which is more of a medium blue, has a darker silver, almost charcoal color metal-like hardware. The fully lined interior offers split book opening providing two full packing compartments. One side is with a zippered divider, along with a outer mesh pocket and two shoe pockets. On the opposite side is an extra small zipper pocket which is excellent for jewelry or other little things. Plus compression straps are there to soundly secure the bags contents. The compartments make it much easier to keep the bag organized. This would be a great bag to utilize some packing cubes. The bag is not overly complicated inside. 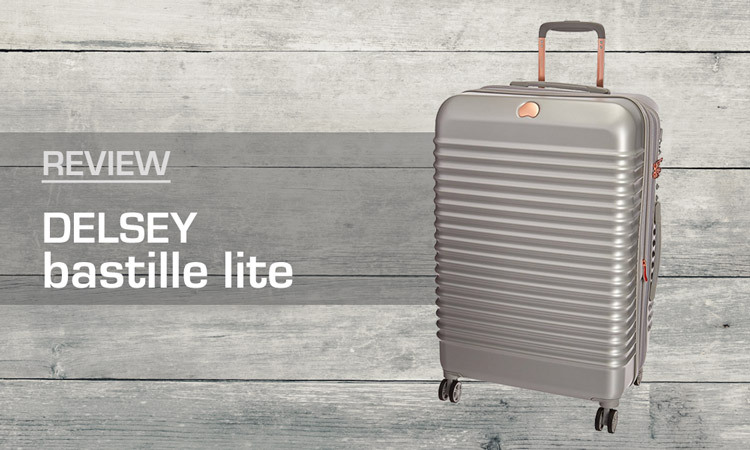 Rather it fits the overall minimalist feel of the Delsey Bastille Lite line. The Delsey Bastille Lite Suitcase comes in 3 sizes: 21″ carry-on, 25″ and 29″. 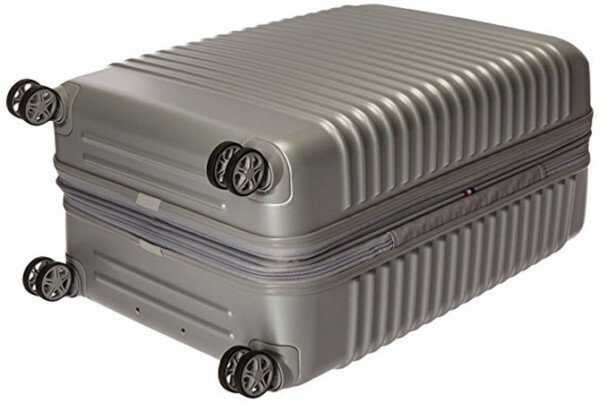 Delsey has established a reputation for strong and durable luggage. The Delsey team put all their models through a rigorous testing system, and only the strongest survive to make it to the market. The Delsey Bastille Lite suitcase seems to stay true to the brand’s good reputation. Ribs across the front of the case seem to help reduce bowing when heavy items are placed on top of it (when closed). The corners appear sturdy, however I did read one review about the case denting, as is the problem with some hardside luggage. It’s not a common problem, but it’s definitely something to be aware of. The good news is this suitcase comes with a 10 year warranty. I also spent quite a bit of time reading over user reviews to see if there were any issues with the handle twisting and breaking, or the wheels not rolling smoothly, but did not find any. So it seems that this Delsey luggage is a great choice for long term travel. A more common complaint is that the case scuffs easily. This is an issue with most hardcase luggage. And because of the glossy finish, the scuffs or scratches stand out even more. However, in most cases these scuffs can be buffed out. The Delsey Bastille Lite Suitcase can be found around $130 and up, depending on what kind of sale you find. I feel this is a great price for a product that will most likely withstand years of use. Delsey has more expensive models to choose from with some more high-end features, but this is one the lightest on the market. Making it an appealing mid-range option while still getting the Delsey brand of durability and style. User reviews on various websites average around 4.0 stars out of 5. At only 7.3 pounds reviewers are raving over the ultra-lightweight of this bag. Lighter bag means more room to pack, which is totally what I want in a suitcase. 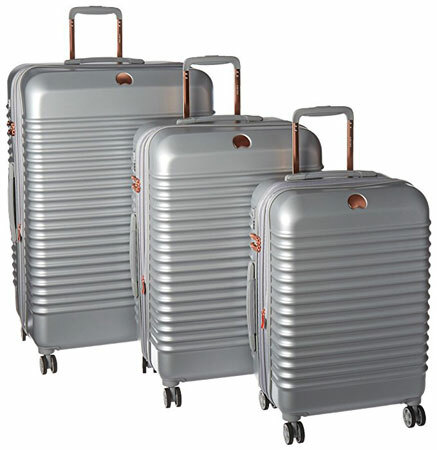 In addition the 4 spinning smooth-gliding wheels insure this luggage will not likely be a source of back pain on a trip. As for the claim that the case scuffs or scratches easily. It’s not a common complaint, but nonetheless it’s been said. I’m not overly concerned about it, since the scratches and scuffs seems reported seem to be very minor and can be buffed out. 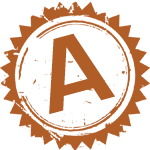 Durable, professional, with a simplistic modern look, and at a great price, plus a warranty. It’s a win,win,win,win,win. You can find the Delsey Bastille Lite Suitcase on Amazon as a affordable luggage choice without sacrificing quality. This bag will be perfect for a variety of people for business or personal use. 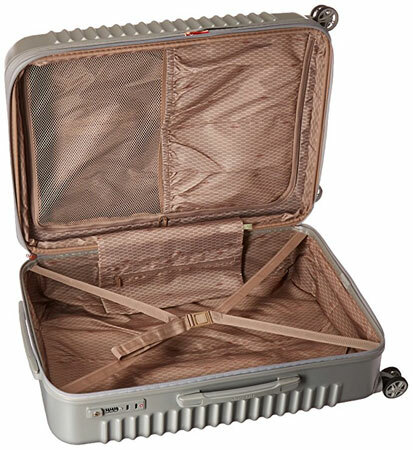 For a more scratch resistant suitcase from Delsey, I recommend the Delsey Chatelet which has a beautiful textured finish. Or you could consider Samsonite Inova which has similar characteristics but resists scuffs a little better in my opinion.